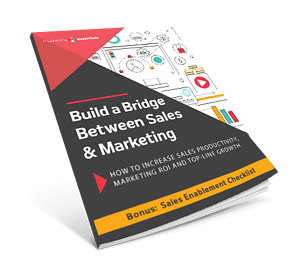 Break down the barriers and build a bridge toward collaborative efforts between marketing and sales. Learn how to align the two teams and implement sales enablement strategies that improve ROI, productivity and company growth. Introduction: It takes one team, one goal, one vision. Chapter 3: What is Sales Enablement? We are a results-driven team of digital marketing and sales experts who have worked with top B2B and B2C companies. We provides sales services and consultation to help companies sell more efficiently at a higher velocity. Our sales services include: sales and marketing alignment facilitation and development, sales enablement coaching and consulting, sales process assessment and implementation, digital sales coaching, CRM implementation and more.